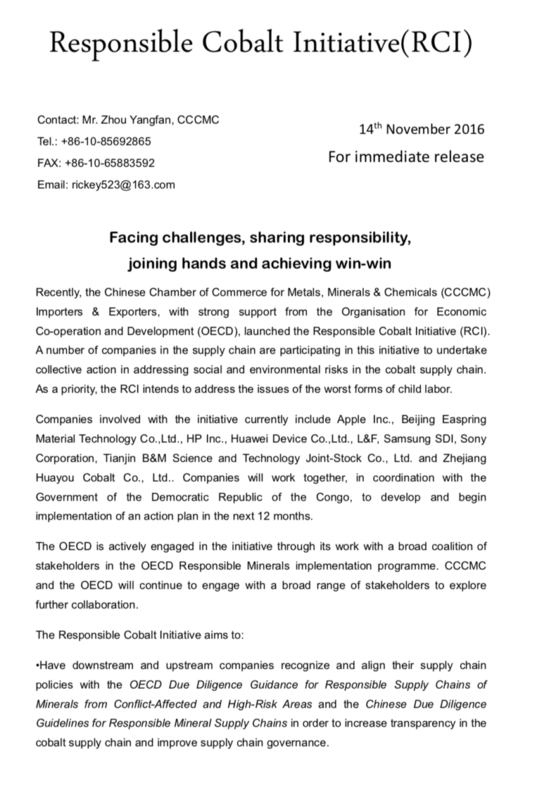 string(1056) "Resource Centre > Uncategorized > Responsible Cobalt Initiative (RCI)"
Have downstream and upstream companies recognize and align their supply chain policies with the OECD Due Diligence Guidance for Responsible Supply Chains of Minerals from Conflict-Affected and High-Risk Areas and the Chinese Due Diligence Guidelines for Responsible Mineral Supply Chains in order to increase transparency in the cobalt supply chain and improve supply chain governance. Promote cooperation with the Government of the Democratic Republic of the Congo, civil society, and affected local communities to take and/or support actions that address the risks and challenges in the cobalt supply chain. Develop a common communication strategy to communicate progress and results effectively to impacted communities, miners, and the public; to harmonize working objectives and plans with other stakeholders.